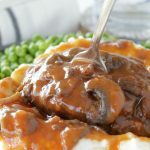 Beef short ribs and spicy Italian sausage are slow cooked to perfection in this Slow Cooker Short Rib Sunday Gravy. Thank you to the Ohio Beef Council for sponsoring this post. All opinions are mine alone. I don’t have any Italian ancestry as far as I know, but if I had to pick a favorite type of food to cook, I’d probably pick Italian. I was lucky to visit Italy back before I had children and the food made quite an impression on me. 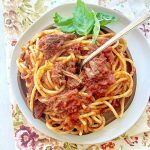 Americanized versions of traditional Italian dishes are obviously not the same, but I still try in my own kitchen to create Italian-inspired dishes that are as delicious as they are simple. 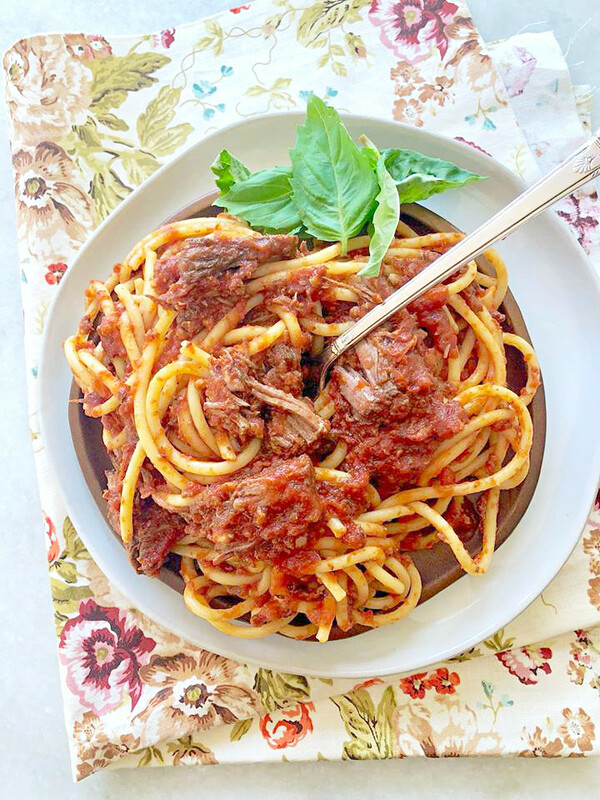 This Slow Cooker Short Rib Sunday Gravy is not quite as simple as the Instant Pot Bolognese Pasta Sauce I recently shared. But it’s worth the extra time involved to fix it. If you’ve never heard of a Sunday Gravy before, I’ve done a little research to help you understand the term. It’s believed to be derived from a Neapolitan Ragù. 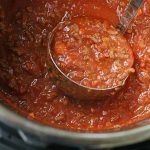 While a bolognese sauce contains very finely chopped meat, a Neapolitan ragù (or gravy) uses a variety of whole meat. In this case I used a spicy Italian sausage to start building flavor and whole beef short ribs as the star of the show. 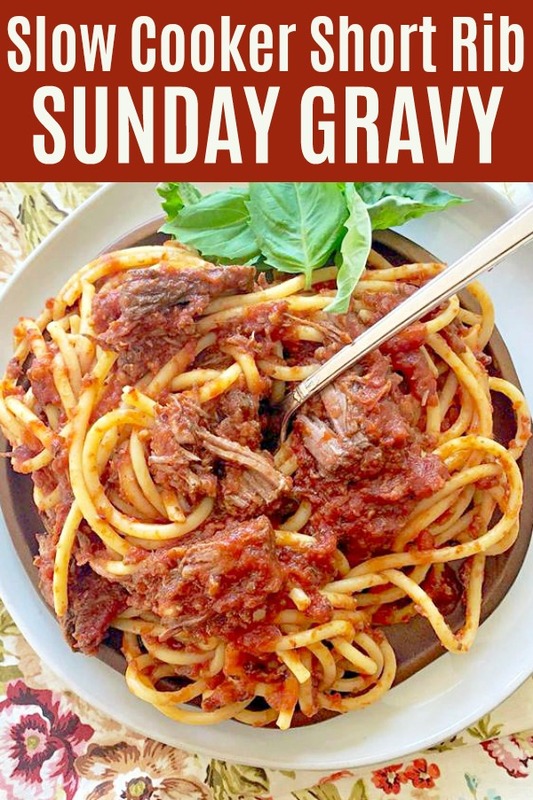 If you truly want to serve this Sunday Gravy on a Sunday I would advise to get the sauce into your slow cooker on a Saturday night and then let the gravy cook overnight. The next day you’ll be able to remove the bones and gently shred the beef short ribs into the sauce. Continuing to cook this gravy on low heat until you are ready to sit down to Sunday dinner will only improve the flavor. It is a hearty meal that your family will be able to tell was fixed with love. I used four, English cut short ribs in my recipe. You could use up to six short ribs for an even meatier sauce. Cook this recipe on LOW heat, not high. You really want the flavors to build slowly and the short ribs need time to break down and become tender. I brown the short ribs before adding them to the slow cooker because it boosts their flavor even more. Preheat the slow cooker. Turn it to low while you are browning your sausage and short ribs and reducing the wine – so the slow cooker is already warm when you add your gravy ingredients to it. 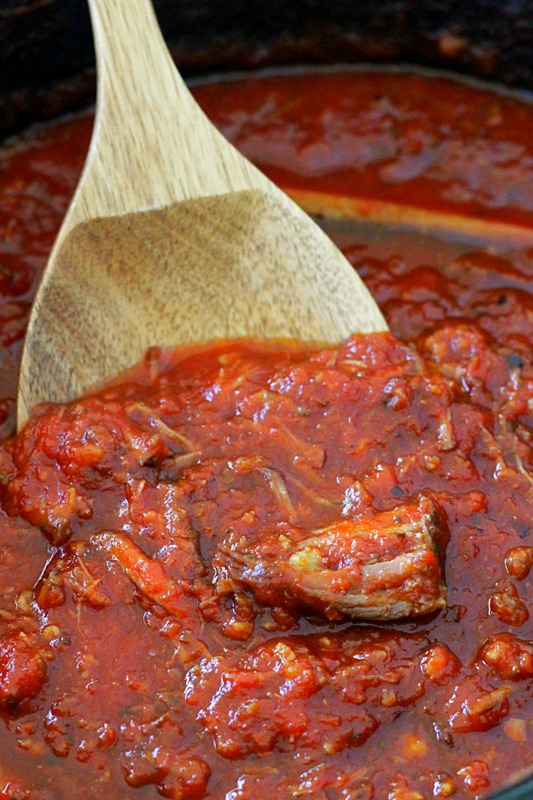 Beef short ribs and spicy Italian sausage are slow cooked to perfection in this Slow Cooker Short Rib Sunday Gravy. 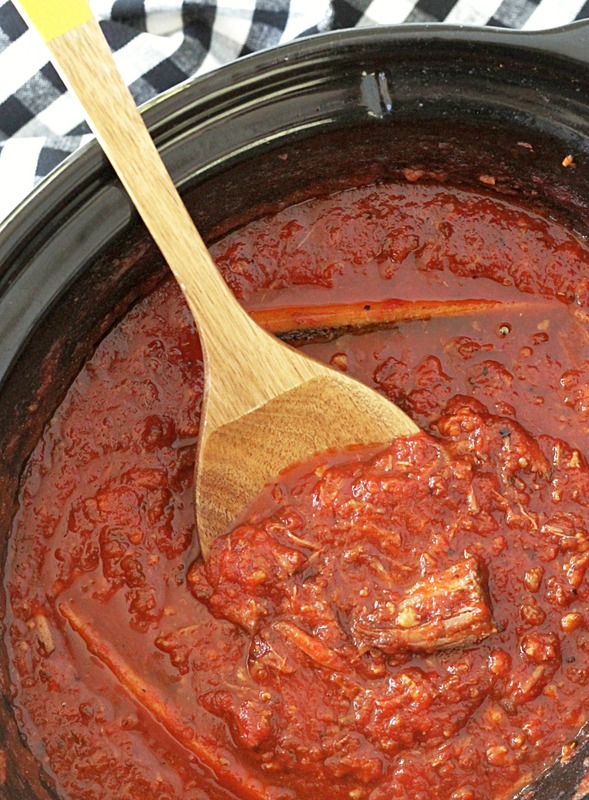 Turn an 8-quart slow cooker to LOW heat. In a large pot over medium heat on the stove, add the oil. When the oil is hot, add the onion and garlic and cook just until the garlic is fragrant, about one minute. Add the sausage and break up the meat very fine with a spoon or spatula as it is cooking. Once the sausage is cooked through, add it to the slow cooker. To the same pot, add the short ribs and brown them for a few minutes on both sides. Add the short ribs to the slow cooker. In the same pot, add the red wine and tomato paste. Whisk to combine. Scraping up all the browned bits on the bottom of the pot as you whisk. Allow the wine mixture to simmer for a couple of minutes, to cook off the alcohol. Stir in the crushed tomatoes, sugar, salt, oregano and basil. Transfer the wine and tomato mixture to the slow cooker. Gently remove the short ribs. Discard the bones. Shred the meat and stir it back into the sauce. You can continue to cook the Sunday gravy on LOW heat for a few more hours until ready to serve. Serve the gravy over your favorite pasta. on beef, which is a healthy, high-quality protein choice. improved sustainability by five percent in the past six years to help feed a growing world population. It’s recipes like these that make me wish I had grown up in an Italian household. It would have been wonderful to have comfort food like this every Sunday! Can’t wait to try this! I totally agree. Thanks Pam! 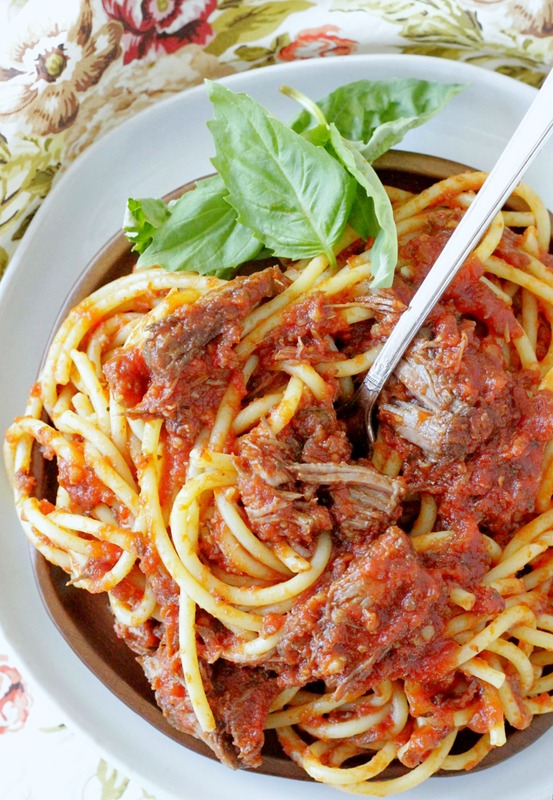 My mom used to throw leftover steak into her spaghetti sauce and that was my favorite way to eat it – this sounds similar and I love short ribs even more so I am going to try this! Yes! I think part of the idea was that it ended up being kind of a “leftover” pot as well. So glad to hear you’re going to try it! I was just thinking today that I needed to put something in the slow cooker. It makes busy days so much easier. I can’t wait to this as I love short ribs. So glad to hear you love short ribs. I hope you enjoy this recipe! Such a simple recipe but the slow cooking and the meat really help bring out the flavor! Looks delicious too! I grew up in an Italian home, and I’m happy to say, I think you nailed it! I love the idea of using short ribs and can’t wait to try this in my crockpot. Wow, thank you! That’s a great compliment to receive!